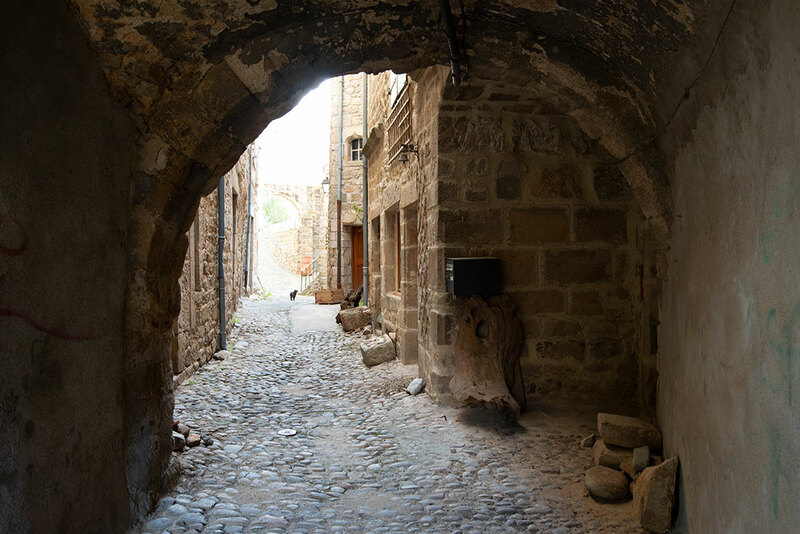 When we decided to visit the villages of my ancestors in southern France, we had no clue we were entering an enchanted land with mountain strongholds, a walled medieval town, a magic sword, old leather bound books and a 13th century church. This blog and next week’s recount the thrilling tale of our adventure into the past. After years of military service that included the Franco-Prussian War of 1870-71 in which French Emperor Napoleon III was captured and his army defeated, a French soldier named Jean Cyprien Rouviere marched home to his tiny remote village high in the Rhone-Alps. He married a local girl, Rose Euphrasie Noel, and departed so quickly for America that to his life-long regret he and his bride never got to drink the wedding wine that his family had made for him at his birth. Cyprien was fed up. He had strong feelings about the disastrous war, during which he had almost died from smallpox and thousands of his comrades-in-arms had died. He had become a confirmed pacifist. He was going to America, he declared, so that his sons wouldn’t have to fight any more wars for ambitious emperors. Ending up in Colorado, he built a prosperous cattle ranch and had six children, one of whom became my grandfather and bequeathed to me the family’s surname, characteristic black hair and olive complexion. Having spent a lifetime explaining all three to Americans who thought I must be Hispanic, I have long been interested in returning to find my true southern French roots. 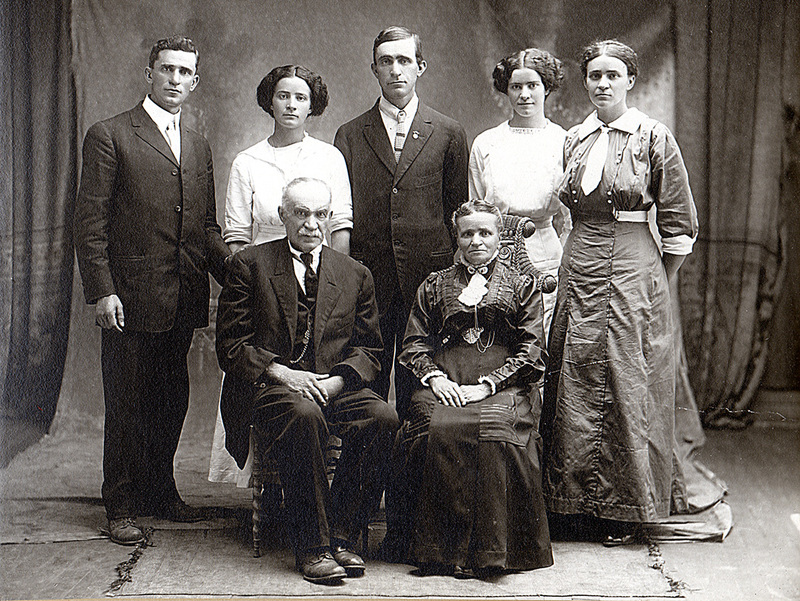 Jean Cyprien Rouviere and his wife Rose Euphrasie Noel Rouviere with five of their six children after Cyprien had become a cattle rancher near Gunnison, Colorado. One hundred forty-five years after Cyprien left, I finally returned to the land of Joyeuse, a town with a walled medieval fortress surrounded by tiny villages from which many of my ancestral lines came. It was a magical journey to what was once the ancient state of Vivarais. Evidence of human habitation in my family’s homeland dates back as early as the Paleolithic era. The area was a trade route over the mountains during the Roman Empire and there is still some Italian influence in the region today. The region was one of the earliest to convert to Christianity under the influence of 2nd century missionary Andeol, a disciple of Polycarp who was a disciple of John the apostle. Andeol was martyred by Roman Emperor Septimus Severus not too far away from my ancestral villages on May 1, 208. The influence of Christianity pervades the landscape. Each village has an old stone church dating back to the 10th-13th centuries, many with bells that ring at key times in the day. Many villages are named after Christian apostles or saints - St. Jean, St. Pierre, St. Etienne, etc.. Stone crosses dot the land. Most of my known ancestors were named after saints –Jean (John), Marie (Mary), Magdelaine, Joseph, Pierre (Peter), Andre (Andrew) and other Biblical names. As the Roman empire fell apart, the Ardeche region went through an unsettled period. Villages became walled stone strongholds with narrow walled streets and with the village churches at the center. Both stone and trees are abundant in the area and are the chief building materials. The thick walls of houses are built of indigenous stone – darker stone high in the mountains and blond in the foothills. Roofs are framed with wooden beams that hold up ceramic tiles or thick stone shingles. The houses were built with small high windows to make them more defensible. 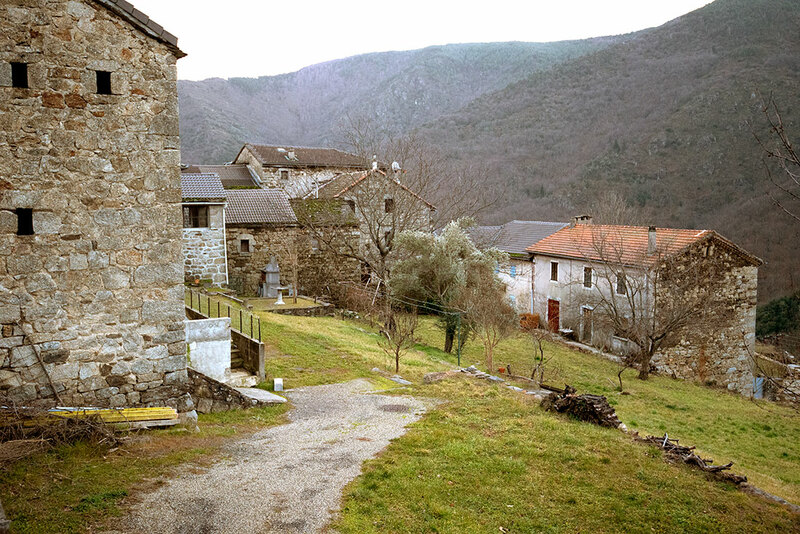 My great grandmother's birthplace, the tiny community of Vignemerle near St. Jean de Pourcharesse, France. 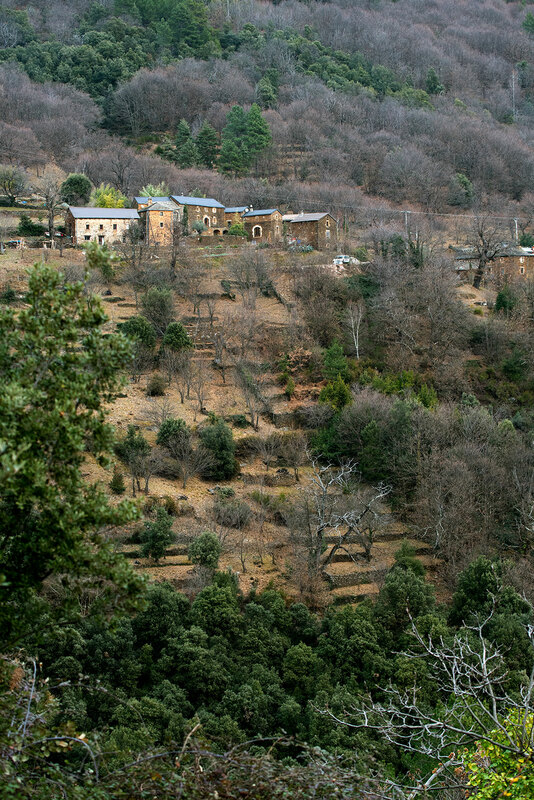 Local farmers cultivated the terraces below the houses . Among the villages from which my ancestors come was the town of Joyeuse, which takes its name from a famous sword wielded by Charlemagne. During the Early Middle Ages, Charlemagne reunited the Western European area that had been part of the Western Roman Empire. He is considered the ancestor of the French and German monarchies. So the legend goes, a blacksmith in the Joyeuse area set out to forge the perfect sword. Charlemagne, hearing of the sword, acquired it. 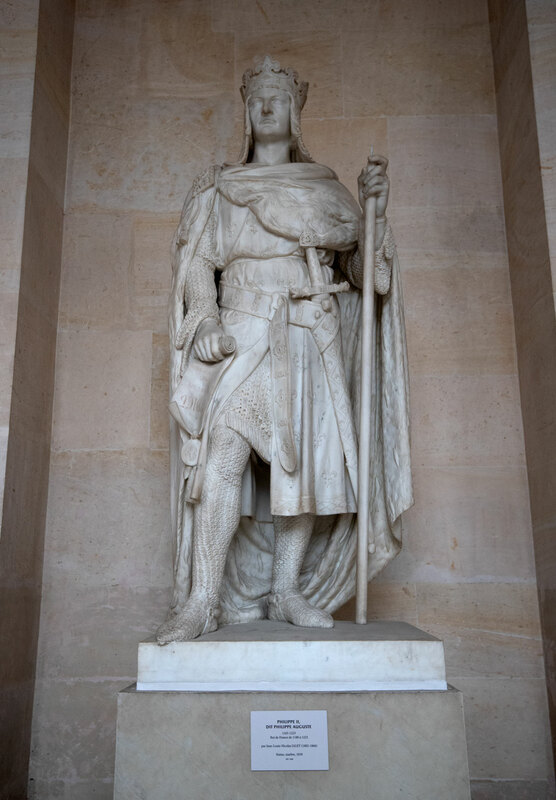 As he chocked up victories in battle that consolidated his power, the sword, named La Joyeuse or the Joyful, developed a reputation for having magical powers and being invincible. When Charlemagne misplaced the sword in the heat of a battle, he offered any soldier who found it a title of nobility. When a soldier located it and brought it to him, Charlemagne gave him the town of Joyeuse as an estate. 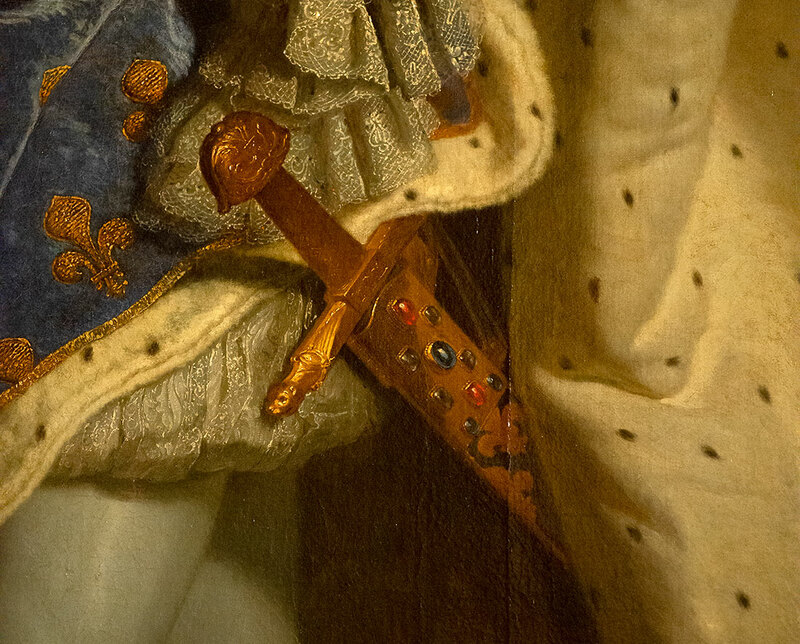 The sword went on to become the coronation sword of France. It was used at the coronation of a number of French kings and rulers including Louis XIV and Napoleon 1. It now is displayed at the Louvre in Paris. 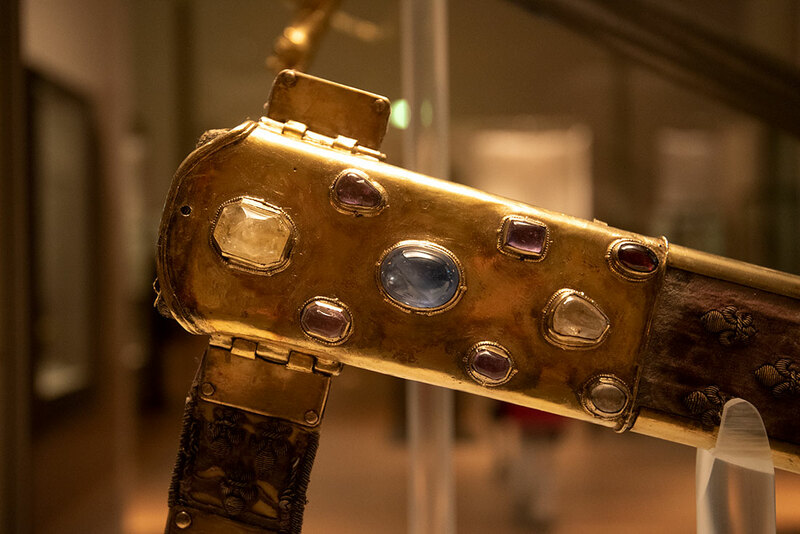 Scholars disagree on whether any original parts of the extant sword, which has been refurbished repeatedly, were wielded by Charlemagne, but it appears in a number of depictions of later French rulers. La Joyeuse at the Louvre in Paris, France. The scabbard of La Joyeuse. La Joyeuse appears in a famous painting of French King Louis XIV at Versailles. French King Philippe II is depicted with La Joyeuse in this statue at Versailles. 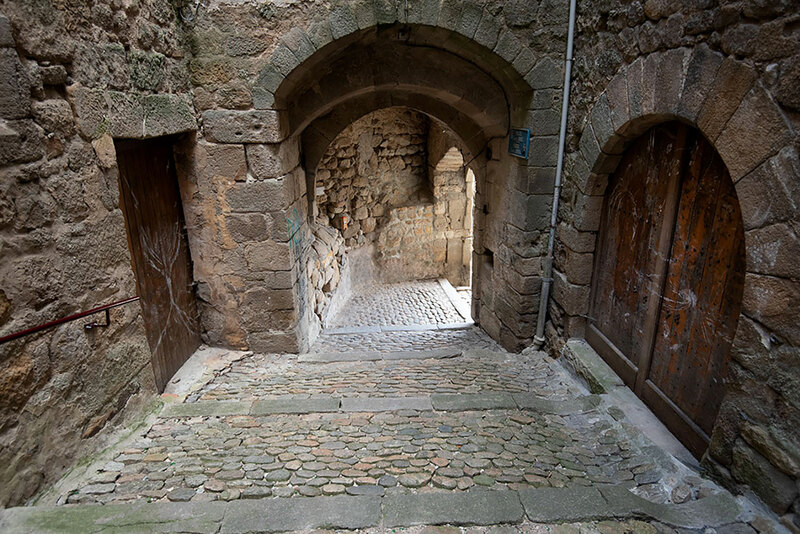 Joyeuse became a walled medieval stronghold that still exists today. Wandering through its narrow stone alleys, in which people still live, is like dropping into Gondor in Lord of the Rings. Homes in the walls once were the living quarters of those who served the Duke of Joyeuse and other local aristrocracy. 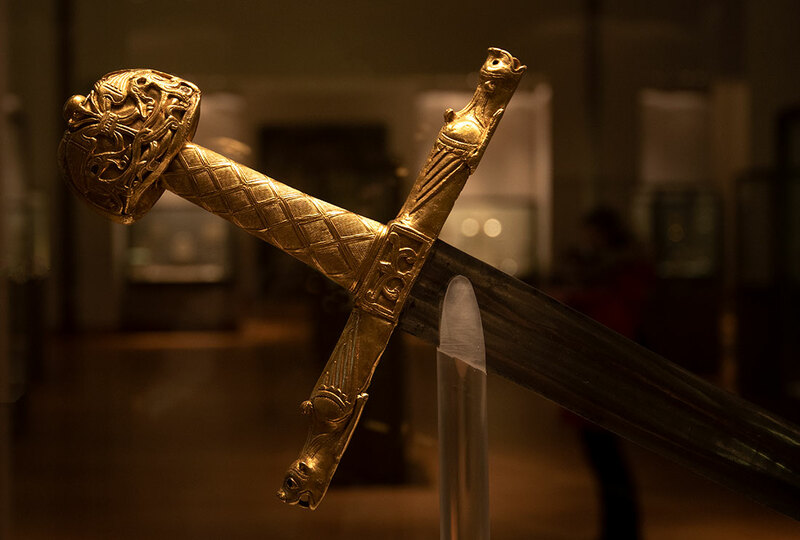 Today, Joyeuse is properly proud of its legend about one of the world's most famous swords. 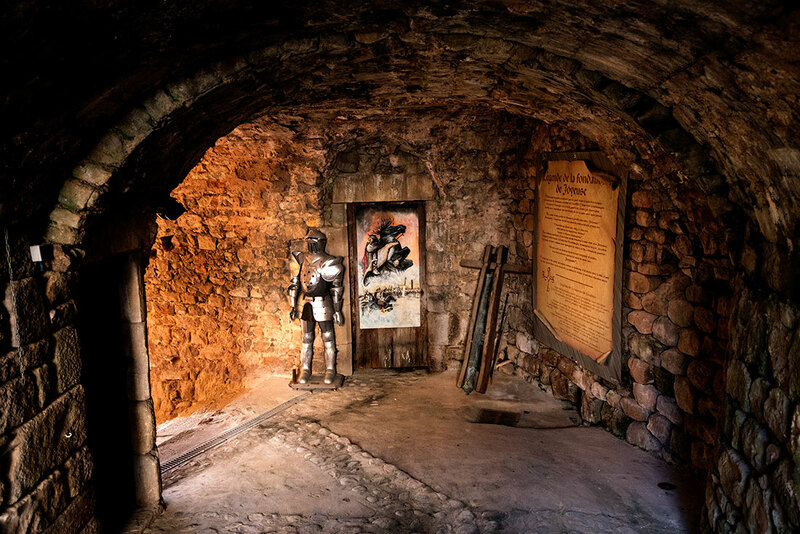 In an underground passage in Joyeuse, replica knight's armour and posters tell the story. Another nearby village where my ancestors are from, Sablieres, has a sadder history. During the 9th century, Saracen slave raiders captured many people in the area and carried them off as slaves, a near-depopulation from which the region took centuries to recover. After the Saracens were subdued, the remnants of their armies were enslaved themselves at concentration camps, one of which was at Sablieres. 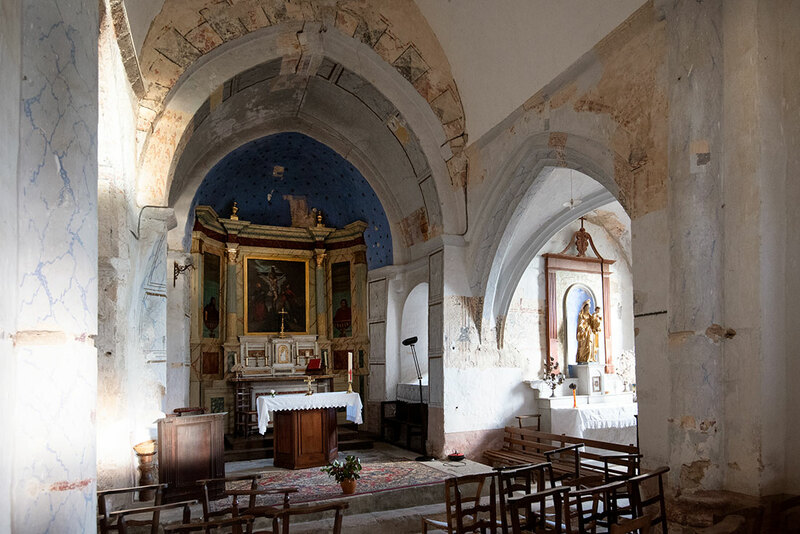 My family’s villages Faugeres and St. Jean de Pourcharesse have churches that date back to the 10th and 13th centuries respectively, although older churches probably preceded them at the same sites. In St. Jean de Pourcharesse, the local mairie, Monsieur Michel Broche, took us into the church. 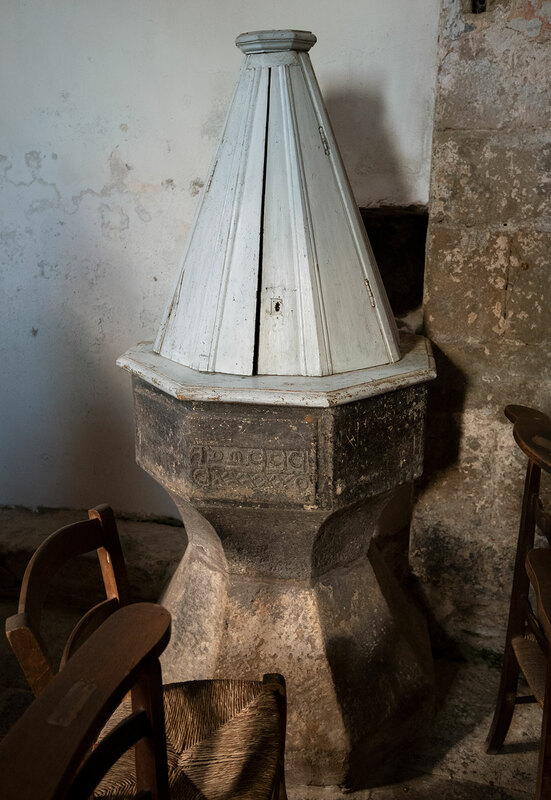 The rough stone baptismal font is carved with a date in Roman numerals which appears to be either AD 1350 or 1450. The church was renovated not long ago and a new altarpiece added in the front of the building, but hung up along a side wall are large photographs of much older wall paintings that proceeded the current altarpiece. Looking at them, I felt like an archeaologist who had unearthed the history of my own family. 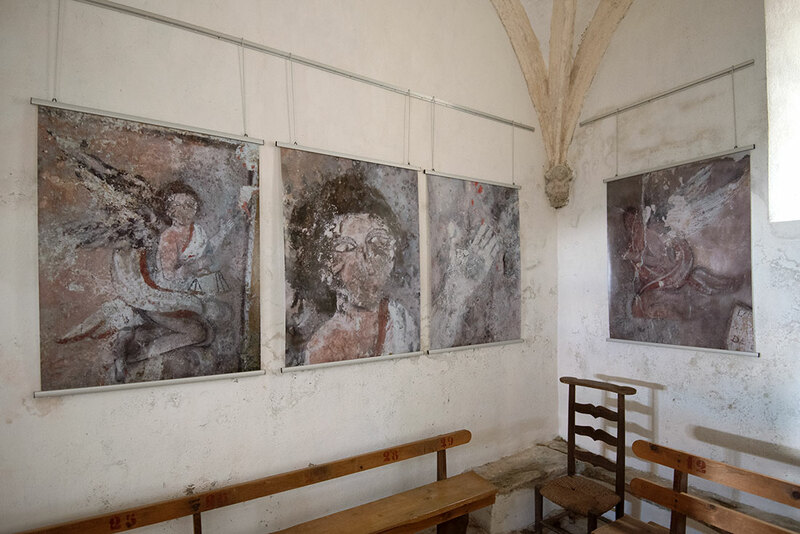 Photographs of wall paintings that were part of an older altarpiece hang on a side wall of the church. Next week, the adventure continues, with old records and stone houses…. Donna Rouviere Anderson and Forrest Anderson are writing a photo-illustrated book on her French ancestry.